S I G N & D I G I T A L G R A P H I C S • March 2019 • 69 F or a sign shop that's ready to add dimensional signage capabilities to its business, a powerful, versa- tile CNC router is just what it needs. Offering dimensional signage allows shops to pursue more customized jobs that come with a solid profit margin, and CNC routers are the most efficient way to fabricate these signs. 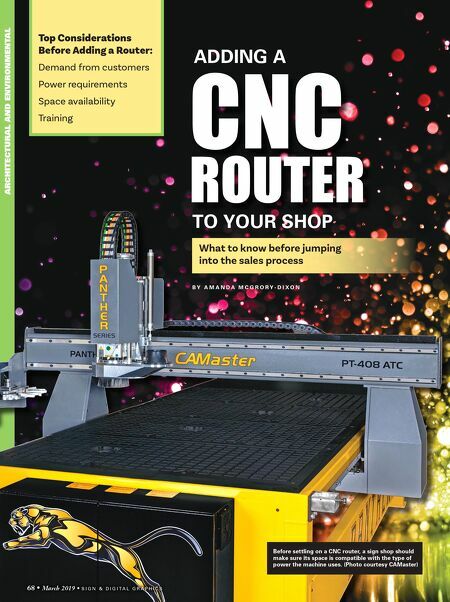 However, CNC routers offer so many features that a sign shop that hasn't pre- viously owned this equipment could be overwhelmed by its choices. Before jumping into the sales process, under- standing the available options can help put a sign shop on the right path. 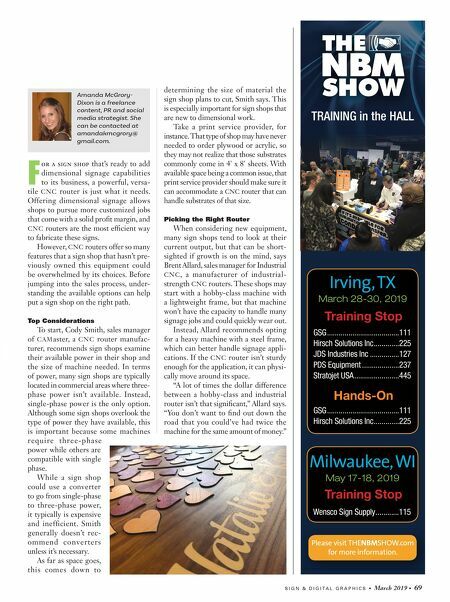 Top Considerations To start, Cody Smith, sales manager of CAMaster, a CNC router manufac- turer, recommends sign shops examine their available power in their shop and the size of machine needed. In terms of power, many sign shops are typically located in commercial areas where three- phase power isn't available. Instead, single-phase power is the only option. Although some sign shops overlook the type of power they have available, this is important because some machines r e q u i r e t h r e e - p h a s e power while others are compatible with single phase. While a sign shop could use a converter to go from single-phase to three-phase power, it typically is expensive and inefficient. Smith generally doesn't rec- o m m e n d c o n v e r t e r s unless it's necessary. As far as space goes, this comes down to Amanda McGrory- Dixon is a freelance content, PR and social media strategist. She can be contacted at amandakmcgrory@ gmail.com. Milwaukee, WI May 17-18, 2019 Irving, TX March 28-30, 2019 TRAINING in the HALL Wensco Sign Supply ............115 GSG .....................................111 Hirsch Solutions Inc .............225 JDS Industries Inc ...............127 PDS Equipment ...................237 Stratojet USA .......................445 GSG .....................................111 Hirsch Solutions Inc .............225 Please visit THENBMSHOW.com for more information. Training Stop Training Stop Hands-On determining the size of material the sign shop plans to cut, Smith says. This is especially important for sign shops that are new to dimensional work. Take a print service provider, for instance. That type of shop may have never needed to order plywood or acrylic, so they may not realize that those substrates commonly come in 4' x 8' sheets. With available space being a common issue, that print service provider should make sure it can accommodate a CNC router that can handle substrates of that size. Picking the Right Router When considering new equipment, many sign shops tend to look at their current output, but that can be short- sighted if growth is on the mind, says Brent Allard, sales manager for Industrial C N C , a manufacturer of industrial- strength CNC routers. These shops may start with a hobby-class machine with a lightweight frame, but that machine won't have the capacity to handle many signage jobs and could quickly wear out. Instead, Allard recommends opting for a heavy machine with a steel frame, which can better handle signage appli- cations. If the CNC router isn't sturdy enough for the application, it can physi- cally move around its space. "A lot of times the dollar difference between a hobby-class and industrial router isn't that significant," Allard says. "You don't want to find out down the road that you could've had twice the machine for the same amount of money."